In the bowl of a food processor, or in a medium mixing bowl, pulse or stir together the cookie crumbs, butter, 1/4 cup of the sugar, and salt until completely combined. Press the mixture into a 9” tart pan so that it covers the bottom and the sides completely. Place on a baking sheet and bake for 10 minutes. Remove from the oven and baking sheet and cool on a rack until ready to use. Add the mango chunks and lime juice to a blender and puree until very smooth. Add the egg yolks and the remaining 1/4 cup sugar and pulse a few times to combine. With blender running, steadily stream in the sweetened condensed milk until all is combined. Pour the mixture into the cooled tart shell and bake for 20 to 25 minutes, or until center is set. Allow to come to room temperature on a rack, then chill in the refrigerator for at least 1 hour before serving. 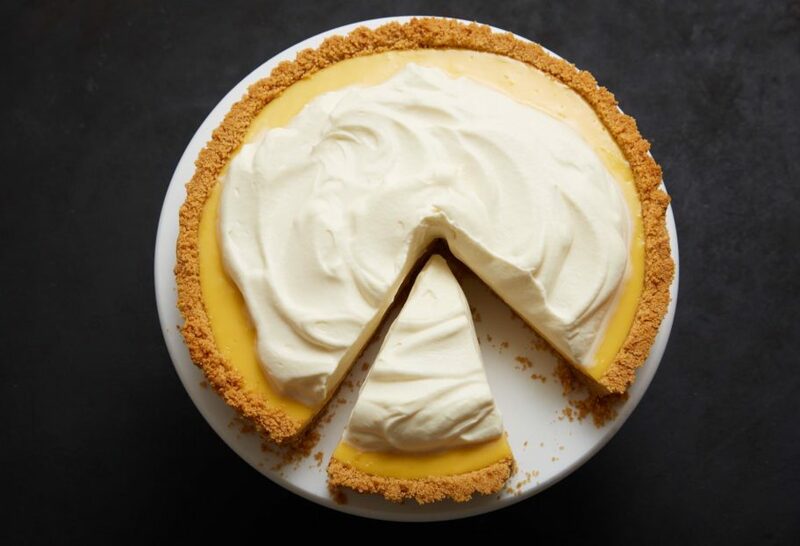 While tart is chilling, in a small bowl, whisk the cream of coconut with 2 tablespoons of the heavy cream until the cream of coconut is dissolved. Add the coconut mixture and the remaining heavy cream to the bowl of a stand mixer, set with the whisk attachment. Whip until soft peaks form. Chill until ready to serve. When ready to serve, remove the tart from the pan and top with the coconut whipped cream. Slice and serve. Hi Pati, I made your Mango Lime Tart and there is something drastically wrong with the recipe. Too much butter! The crust would not set up, swimming in butter . I resorted (after 2 tries with different biscuits) to one of my own recipes for the crust. The flavor of the mango lime combination was tasty, but it did not really set up nicely. I’m not sure what went wrong, Inge, I’ve made this recipe many many times and haven’t had trouble with it. I’m sorry you had this experience, want to give it another try? I see that I can chill this at least one hour before I put on cream and serve- what’s the most you would recommend chilling this- ie how far in advance can I make this? P.S. Your show is my favorite pbs cooking show ever, and I LOVE pbs cooking shows. Thanks so much for the work you do. Oh you can make it a couple of days in advance, Gretchen. And thank YOU so much! Do you think I can make this in a rectangular 14-in tart pan? I just watched this episode on Create. Did you say you were using a special mango that’s core is not as big as most? I missed the name of the mango. I have just recently started using fresh mango but the mango i have used has quite a large core. Thank you. I love your show too! I used Yellow Ataulfo (Honey) Mangoes from Mexico, Robert. They are YUMMMMM. I made this recipe right after I saw it on your show because my husband thought it looked amazing. I followed the recipe exactly…it was super easy to make and it was ridiculously delicious. My husband raves about it. I am making it for Thanksgiving even though it’s not a traditional dish for that…who cares, good is good. Oh I’m so happy your husband loved it…have a great Thanksgiving, Nicole. Can I use frozen mango? I know fresh is best, but not always ripe or available in my town. If you can’t find fresh mangoes, you can use frozen for sure, Peggy. Can I just put regular whip cream on top, not with coconut cream? Sure, go for it, Odalis. I’m having trouble finding coconut cream. I’ve heard that you can put canned coconut milk in the refrigerator and then skim the cream that comes off the top. Would that work? I recommend you buy coconut cream…you can usually find it at your local market in the canned food aisle, or international food aisle, or even with the drinks (it is often used to make pina coladas). Cream of coconut…like coco lopez? Exactly…and lots of other brands make it as well. Hello, I am not sure if the cream of coconut is a powder or a liquid. Your receipe says to mix until cream of coconut is “dissolved “. Cream of coconut is a liquid, but it has some chunks in it, which need to be whisked until it is smooth or dissolved. A question about the sugar: is the 1/4 cup sugar divided between crumb crust and later with egg yolks? What would the measurements be for the sugar? Oh thank you for catching that, Joanie. I’ve updated the recipe. You use 1/4 cup with the crust and another 1/4 cup with the eggs.